Followers of the live OspreyCam video stream offered by William & Mary's Virginia Institute of Marine Science were subjected to a gut-wrenching display last week as one of this year’s two chicks became entangled in fishing line brought to the nest by a parent. 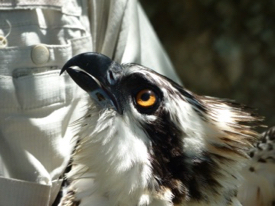 Despite efforts by staff from VIMS, the Center for Conservation Biology at William & Mary, and the Wildlife Center of Virginia, the line and consequent immobility caused so much damage to the wing of the fledgling chick that the young bird — estimated at 7-8 weeks of age — had to be euthanized. Bryan Watts, director of the Center for Conservation Biology, headed the effort to reach and disentangle the chick — a difficult endeavor given the nest’s location on a tall pole rising from the shallow, wave-tossed waters in front of the VIMS campus in Gloucester Point. 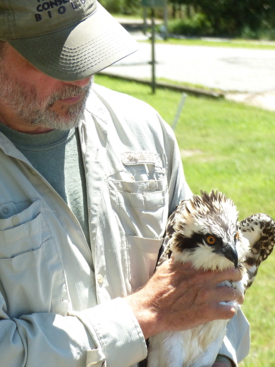 Aiding in the rescue effort were VIMS Marine Safety Officer Jim Goins and News & Media Director David Malmquist, who helped establish the VIMS OspreyCam in 2011. 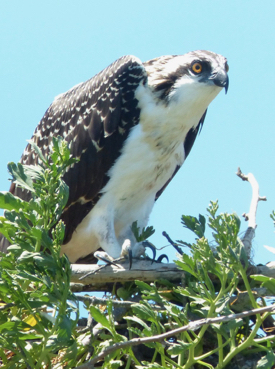 Watts — who also founded OspreyWatch, an online community focused on observing breeding osprey in more than 6,000 nests worldwide — notes that trash in osprey nests is a chronic problem, one that stems from the birds’ instinctual habit of retrieving eelgrass blades and other naturally buoyant materials to line the nesting surface. 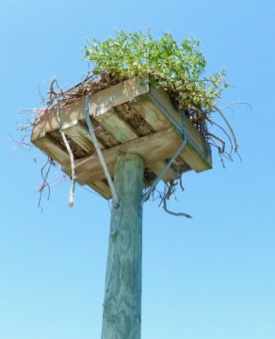 Indeed, during the last few years, followers of the VIMS OspreyCam have seen the breeding adults return to the nesting platform with plastic bags, cup lids, flip-flops, a swim diaper and other unidentifiable plastic items. Monofilament fishing line — whose chemical formulations include polyethylene terephthalate and polyvinylidene fluoride — is yet another form of this plastic trash. The timing of entanglement for the OspreyCam chick — a female — was particularly unfortunate, as it occurred during the critical period when the developing nestlings begin to exercise and strengthen the wing and breast muscles needed for fledging and flight. “It (the entanglement) was particularly bad at a time like this when the bird is developing muscle and control,” says Watts. Recognition of the potential environmental impacts of discarded monofilament line has led many conservation organizations — including the U.S. 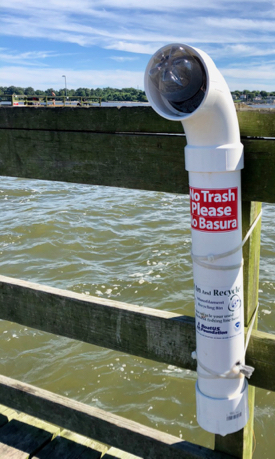 Fish and Wildlife Service and the Clean Marina program at VIMS — to place specially designed monofilament recycling receptacles in and near areas frequented by anglers. There have also been efforts to develop biodegradable alternatives, using materials similar to those being tested for use in biodegradable crab-pot panels at VIMS. The angling site nearest the VIMS OspreyCam — the Gloucester Point Fishing Pier — features three such containers. Unfortunately, despite clear instructions and warnings, a recent visit to one of these containers showed it clogged by a firmly lodged plastic bottle.